If you’re looking for the best teapot for loose tea leaves, you’re probably a serious tea drinker who dislikes most teabag teas and prefers organic and boutique teas that often come in loose leaf form. The best teapots for loose leaf tea include a loose tea steeper so that the fine leaves are easily separated from the brew. The steeper has to be large enough to hold a good amount of leaves without being tightly packed in. This allows for the water to properly surround the tea leaves while brewing for maximum flavor. Keep in mind that these are teapots that are not really meant for heating the water, although some are microwave safe. You are better off heating the water first, perhaps with a kettle that has variable temperature control. If all this seems like too much work for you, choose a fancier tea making machine that heats the water, brews and dispenses your tea. The following loose tea maker options are the most popular ones found online. They are among the best if you want an electric tea kettle with infuser. If you are a passionate loose leaf tea drinker, then this is the teapot for you! At 700ml, the Hario Chacha Kyusu Maru Teapot holds enough water to brew two or three cups of tea. It has a delicate and pretty rounded shape and is made of clear glass so you can actually see the tea leaves swirling around in the infuser as they impart their delicate essences into the water; and you can pour the infusion out when it reaches the desired shade of strength. The large stainless-steel infuser ensures the tea leaves are not clumped together but are free to expand and unfurl in the water. To make the perfect cup of tea, you would fill the pot with hot water (heated to the temperature appropriate for the tea you are making), drop the desired amount of tea leaves into the infuser, put the infuser into the pot, and put the lid on. Wait till the color of the water indicates that the brew has reached its desired strength or time the brewing process and then pour the infusion into a cup. Some people fill the teapot with cold water and heat in a microwave instead of using a separate kettle to heat the water. Be careful while pouring the tea out though – the lid has a tendency to fall off when pouring at too sharp an angle. The beak of the teapot is well designed and pours smoothly without any dribbling. The handle does not seem to get hot even though it is attached directly to the body of the teapot. Some users have complained that your grip tends to slip and allows the hot teapot to come in contact with your hand. Other users have also mentioned that it is difficult to take the infuser out if one wishes to stop steeping at a certain stage because the infuser gets very hot. Cleaning the teapot is a cinch! Just empty the used tea leaves from the infuser and put the pot, lid, and infuser into the dish washer. You may need to hold the infuser under a blast of water to dislodge some stubborn tea leaves before doing that. If you prefer to hand wash the teapot, its wide mouth gives you easy access to the inside of the pot. However, some reviewers have mentioned that the top part of the infuser, where it bends, is hard to clean. This is the perfect teapot if you love to drink loose leaf tea in the office or even while traveling. The Adagio Teas ingenuiTEA is pretty solid, made of clear food-grade plastic and shaped rather like a large travel mug with a funny undulating handle and hinged lid, and holds 16oz of tea. It has a rather wide base, and a special stand on which it sits – although you don’t really need to use the stand. To use the teapot, make sure that the filter is fitted into the bottom of the infuser (if you have taken it out), put your tea leaves in, and pour the hot water in on top of the leaves. The water fills up in the body and you will see the leaves whirling around in the water. When the tea has reached the desired shade, just pick up the infuser and make it sit on top of your cup (the mouth of your cup must be smaller than the base of the infuser). This causes a valve on the bottom of the infuser to be opened, and the clear distilled tea pours through the mesh filter and down into the cup. When you lift the infuser off, all that is left in it are the spent tea leaves. To clean, empty the leaves out, and put the teapot and filter into the dish washer. Users like the fact that this teapot is so easy to use and clean, and is perfect for one user. They also note that the hinged lid keeps dust out while your tea is steeping. Other users have complained that the teapot gets discolored over time, and also that the valve at the base may begin leaking if the teapot is used heavily. This teapot is also available in a 32 oz size if you prefer to make more than one cup at a time. The Teavana PerfecTea teapot is a fine adjunct for anyone who loves their loose leaf tea and must have their cuppa no matter where they are – at home, in the office, or in a hotel! It is made of tough, clear BPA free polycarbonate and holds 16 oz. It is shaped rather like a wide cylindrical beer mug, with a clear petal shaped handle on the side and a hinged lid on top to protect your tea while it brews. It has a valve mechanism at the bottom so that when your tea is ready, you simply place the teapot on top of your cup or mug, and the valve opens to allow clear leaf-free brew to flow into it. To use, you simply put in a spoon or two of your favorite loose leaf tea; pour water heated to the right temperature (or iced water if you prefer ice tea), let it steep for as long as you wish, then place the teapot on top of you mug to let the brew drain into it. When filling the water in the teapot, its best to use the actual cup you are going to use to drink it in to measure the amount so that you use just the right quantity and it does not overflow when draining into the cup. To clean the teapot, you can empty the dregs out and rinse with soapy water. It is also dishwasher safe, so you can safely put it in the top shelf of the dishwasher. Users have commented that almost the entire teapot can be dismantled for easy cleaning, although some users have found it very difficult to remove the mesh. Other users have complained that the hinge on the lid and the legs at the bottom are made of weak plastic and can break easily and also that the customer service is poor. A few users have also complained that the teapot began leaking soon after purchase and the teapot had to be replaced. Keep in mind, though, that all these complaints came for the old model 5-6 years ago. The new model seems to have these issues ironed out. This is a great teapot for personal use or to use as a gift, and if handled properly, should brew you many cups of good tea. It is a direct competitor to the Adagio, mentioned above. This teapot is also available in a larger 32 oz size, and in an all-glass variant (which is much more expensive). This is a great teapot for a family of tea drinkers or if you really like to drink a lot of tea. Its handsome globe-like shape is hand-blown from clear borosilicate glass, and is tough yet light. The handle, base, and lid are made from black matte-finish plastic. It has a stainless steel mesh infuser that can be easily removed, and the lid is attached to the handle but flips out of the way when cleaning. This bobuCuisine teapot is meant for those who love their tea hot – it comes with a machine washable tea-cozy that zips up snuggly to keep your tea hot for at least an hour. To use the teapot, simply fill the pot with hot water, scoop your loose-leaf tea into the infuser, put the infuser into the pot, cover, and wait till the tea brews. Then pour, drink, and repeat! It’s perfect for when you need to make 4 or 5 cups of tea for guests. When it’s time to cleanup, it’s easy. It’s dish-washer safe but can be rinsed with warm soapy water if you prefer to do it manually. This teapot is not perfect; some users have complained that the infuser is too deep and is difficult to clean properly (because their fingers don’t fit all the way in). Also there is a wire across the mouth of the infuser that makes it difficult to load the tea-leaves without spilling some and making a mess. The manufacturer does not recommend that this teapot be heated directly in the microwave although some users do so anyway. When zipped up, the zipper of the tea-cozy obstructs the spout and causes the tea to dribble while pouring. Also, it is difficult to put the tea-cozy on after the teapot is filled; however if you put the tea-cozy on before filling the pot it is difficult to gauge the strength of the brew from its color unless you prefer to just time the brewing. All in all, this is a great teapot for family or office use. The best part is that it comes with a lifetime warranty! This teapot is a work of art, a conversation piece, and a brilliant tea maker all rolled into one! At 20oz in size, the Chef’s Star Tea Maker is enough to make 2 or 3 mugs of tea, so it’s not meant for a large family of tea drinkers but should be quite sufficient for a couple. The pot itself is made from clear borosilicate glass, and the infuser, lid, and stand are made from stainless steel, while the handle is plastic. It has a quaint architectural design, yet it is a well-engineered and functional teapot. To use, simply load the infuser with your favorite tea, fill the teapot with hot water, place the lid (and attached infuser) onto the pot, and wait for the infusion process to complete. When the tea has steeped long enough, simply lift the infuser up and out of the water using the handle that slides up vertically out of the lid and then swivels down to the side to lock the infuser in place. Now your tea is not at risk of over-steeping; you can pour and drink at leisure! When it comes time for cleaning, this teapot can be dismantled easily. The tea leaves can be dumped easily. The teapot can be put in the dishwasher or can be washed by hand with warm soapy water. 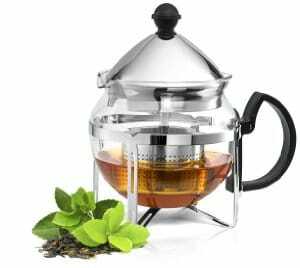 Users have nothing but praise and rate this as the best teapot for loose tea leaves, with all of them commenting on the elegance and design of the retractable infuser that allows one to stop the steeping process at exactly the desired time. A few users were disappointed that the pot was smaller than they had imagined and wished for a larger size. If you are a family that includes coffee drinkers as well as tea drinkers, then this is the teapot for you! The Kona French Press is actually sold primarily as a coffee press but brews a pretty mean cup of tea as well. It is large – 1 Liter or 34 oz in size – so it can make up to 5 cups of tea (or coffee). It is made of borosilicate glass, has a stainless steel mesh filter and plunger, and has a plastic lid and protective casing. The plunger, filter, and infuser base are made of stainless steel while the plunger knob, atop the device, is made of rubber. To brew your perfect cup(s) of tea, you would remove the lid and plunger, drop in a scoop of two of your favorite loose leaf tea, and then pour in requisite amount of hot water. At this point you could, if you prefer, dip in a spoon and stir vigorously to agitate the leaves. After letting steep for a minute or two, put the lid on, and very slowly lower the plunger, pushing the tea leaves downwards while leaving the clear brew on top and then pour the brewed liquid out. Make sure not to push the plunger all the way down and crush the leaves, as this might impart a bitter taste to your tea. You can pour in more hot water to make more tea if your tea leaves have the desired robustness. The Kona French Press is easy to clean, as the filter and plunger are detachable, and all the elements are dishwasher safe. Replacement filters are also available, so you can replace the filter should your existing one gets too clogged over time. Users of the device have praised its versatility, its ease of use, and the quality of the brew that it produces. However, there have been several complaints on the fragility of the glass and that it cracks or shatters easily when dropped or bumped into something. Some users have mentioned that the device is hard to clean, and that the mesh screen deforms when trying to remove or clean. A few users have also mentioned that the instructions are not very easy to follow. If you prefer iced tea, you can make your job easier by getting an iced tea maker instead. Those come with larger pitchers to hold ice and their filter baskets are a bit larger since the best iced tea comes from larger tea bags or tea leaves that are especially good for iced tea.